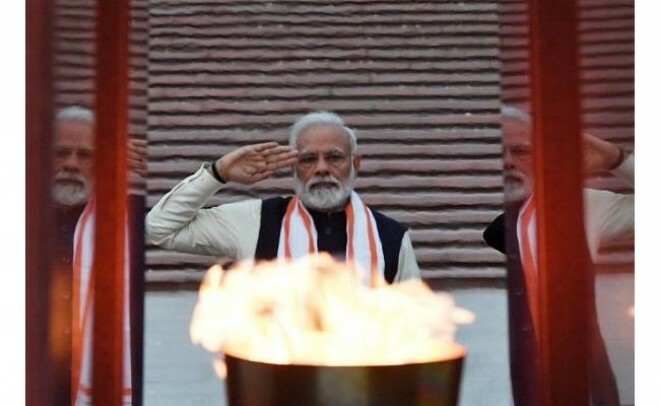 New Delhi, Feb26: Prime Minister Narendra Modi on Monday inaugurated the country's National War Memorial adjoining the iconic India Gate complex in the heart of the capital, nearly 60 years after it was mooted to honor the fallen soldiers after Independence. Spread over an area of approximately 40 acres, the memorial comprises four concentric circles, namely -- the 'Amar Chakra', 'Veerta Chakra', 'Tyag Chakra' and the 'Rakshak Chakra' with names of 25,942 soldiers inscribed in golden letters on granite tablets. It also includes a central 15.5-m obelisk, an eternal flame and six bronze murals depicting famous battles fought by the Indian Army, Air Force, and the Navy in a covered gallery (Veerta Chakra). The prime minister dedicated to the nation the memorial, built at a cost of Rs 176 crore, by lighting the flame positioned at the bottom of the stone-made obelisk. Rose petals were showered by Indian Air Force helicopters and a fly-past in 'Missing Man' formation was also part of the event. Besides, the main memorial complex, a Param Yoddha Sthal has also been built on the northern side of the India Gate's C-Hexagon area. The park is dotted with bronze busts of the 21 awardees, 15 posthumously of the Param Veer Chakra, country’s highest wartime gallantry medal, a senior defense official said. A stone mural depicting a joint operation by the three armed forces also has been made in front of the Param Yodha Sthal. Modi also interacted with three surviving Param Veer Chakra winners and later walked to the memorial complex through the Indian Gate canopy roundabout. A consecration ceremony was also held as successive chants from five different religious rent the air just before Modi lit the eternal flame.